Does navigating a wine list have to feel like an exam that you’re woefully unprepared for? Not according to Carlton McCoy, one of the new breed of wine stewards who are more interested in being your ally than in intimidating you. But McCoy and, thankfully, many more wine experts of his generation are rejecting the stereotype of the pretentious sommelier. As wine director at The Little Nell, a resort whose spectacular wine list alone prompts many skiers to choose Aspen over its rivals, he happily takes responsibility for finding out what his customers really want (and can afford). Here, he explains how to make that panicky wine-list moment a satisfying adventure. How much should the average diner know about wine when they come in? Not much! They just need to be open. First off, we get all the questions on the table: What style do you like? What’s your price point? That’s often a hard conversation, isn’t it? The toughest thing for most people is finding the language to describe what they really like. They might say they generally enjoy “sweet wines.” But does that mean literally sweet? Or do they mean they like ripe, fruity wines that just seem sweet? Do you have a question that gets to the bottom of it? I often ask, “What do you drink at home that you like?” Some people take pictures of the wines they’ve liked. When they show me a label on their phone, I know exactly what style of wine they’re talking about. What should people do when everyone at the table is ordering different dishes for every course? Stick with wines by the glass? I’m not a fan of ordering single glasses through a meal. You get tiny sound bites about the wines, and you don’t remember anything. Plus, sharing a bottle with the whole table is such a great way to enjoy something together. I take back that single-glass advice in one instance—do start with a glass of Champagne. Then go to a half-bottle of white and a whole bottle of red. Is that going to work even if someone ordered fish for an entrée? There are reds that go well with a huge range of food, salmon to steak: Beaujolais, for example, or a dry Brachetto from Piedmont. West Coast Pinot Noirs can work well too—a really elegant Willamette Valley Pinot Noir, like Cristom, from Eola-Amity Hills. And from western Sonoma, Pinot from Arnot-Roberts and Hirsch. You just have to be careful with overly ripe fruit (with their alcohol levels) and oak. You need elegance. If someone has drunk mostly California Cabernet but would like to branch out into the Old World, where would you point them? I’d take them to great Super Tuscans [rule-breaking blends of Sangiovese with Bordeaux varieties] or Brunello di Montalcino [Sangiovese]; Châteauneuf-du-Pape [Grenache-based blends]; and Spanish reds [Tempranillo, Garnacha], which are well priced too. What’s the most tactful way to let a sommelier know how much you can spend? Price isn’t an awkward question at all. If I’m directing a customer to a page of wines from a certain region, I just ask them to point to a bottle they’re comfortable with, and I suggest one a little lower and one a little higher, so they have choices. What if someone wants to splurge, but doesn’t want a current cookie-cutter cult wine? In my book, splurge money is best spent on older wines from classic producers, especially from the Napa Valley: Opus One (I just opened a ’79—beautiful), Diamond Creek, Dominus Estate—from the late ’70s and ’80s. How much are wines generally marked up on wine lists? And are some marked up more than others? The rule of thumb in the industry is 3 times wholesale. At Little Nell, we mark bottles up 2 to 2 1/2 times—obscure wines a little less, otherwise, no one would buy them. And we generally mark up hard-to-get cult wines the most. If we get only a few bottles of something, we don’t necessarily want to sell it fast. What justifies the hefty markups? An insane amount of work (and cost) goes into running a good restaurant wine program. 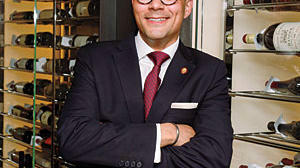 We have to have temperature-controlled storage for 20,000 bottles, multiple sommelier salaries, best-quality glassware, labor to polish every glass … Questioning a wine price on a list is like wondering why the chef is charging me this much for a steak, when I can buy it for $12 at the butcher. How can you tell that a wine list is a good one? I think it has to cover every major wine-growing region in the world and feature the best producers. But it has to have a focus too. Ours happens to be France: Burgundy, Bordeaux, and the Rhône Valley. Where you really get a peek at the wine director’s passions is in the verticals—years’ worth of particular wines. That will show what he or she truly loves. When is it okay to bring your own bottle to a place that has a great wine list? If someone has a very special bottle that means a lot to them, I understand that. But otherwise, it’s like bringing your own food to the restaurant and ordering wine. Is there an inexpensive bottle on your wine list that you’re excited about right now? Jean Maupertuis “Les Pierres Noires” 100 percent Gamay, from Auvergne. It’s vibrant, alive, fresh, clean—it will be a great $30 bottle for this summer.